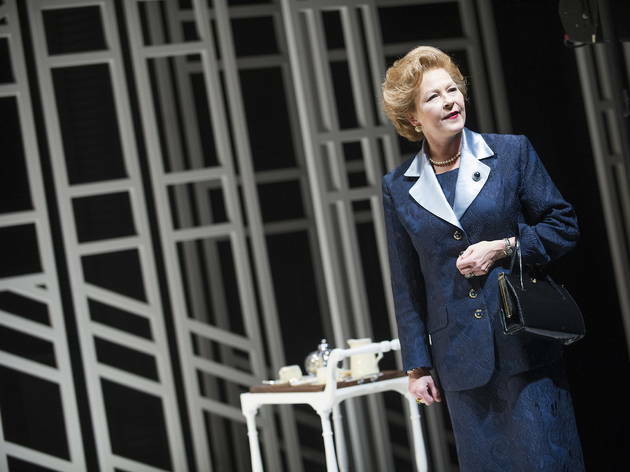 Proving that theatre is sometimes subject to the same law as buses – two come along at once, etc – last year saw two new productions take imaginative liberties with the regular private meetings shared by the prime minister and the Queen. 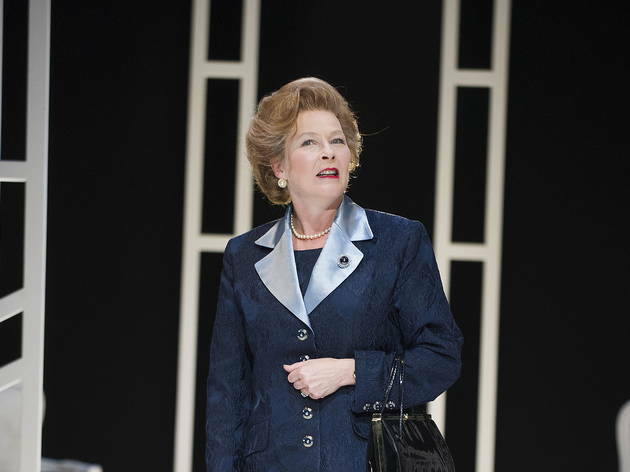 In Peter Morgan’s ‘The Audience’, Helen Mirren – now so firmly set in the national consciousness as our monarch that Her Maj herself is starting to look like an imposter – reprised her regal role before a procession of ministers. 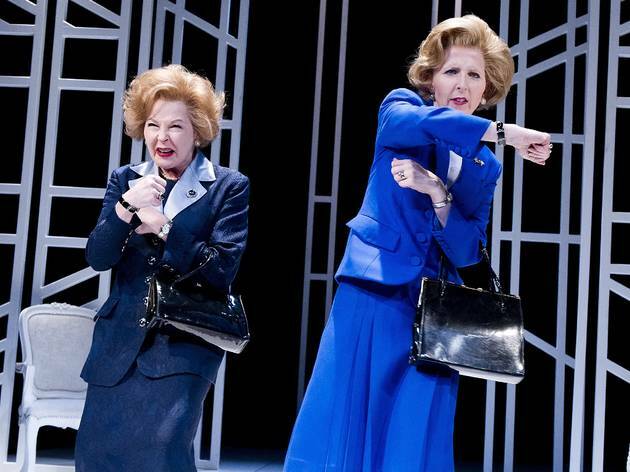 Meanwhile, over at the Tricycle, Moira Buffini’s ‘Handbagged’ focused on the relationship between two key women: Mrs Windsor, of course, and the late Margaret Thatcher. 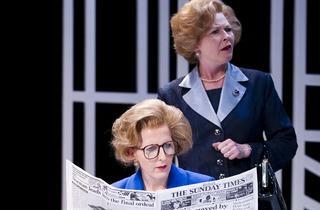 Tricycle artistic director Indhu Rubasingham commissioned ‘Handbagged’ from an earlier, shorter script; she was, apparently, almost deterred by possible similarities with ‘The Audience’. Thank goodness she held firm. 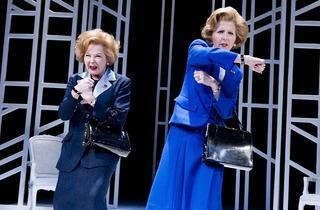 This is a hilarious, intelligent treat – a hit at the Tricycle, and well deserving this West End transfer. 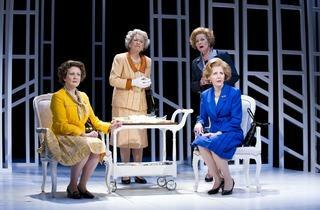 The play’s success depends in large part on the performances of its four actresses, who play older and younger versions of the two leaders. 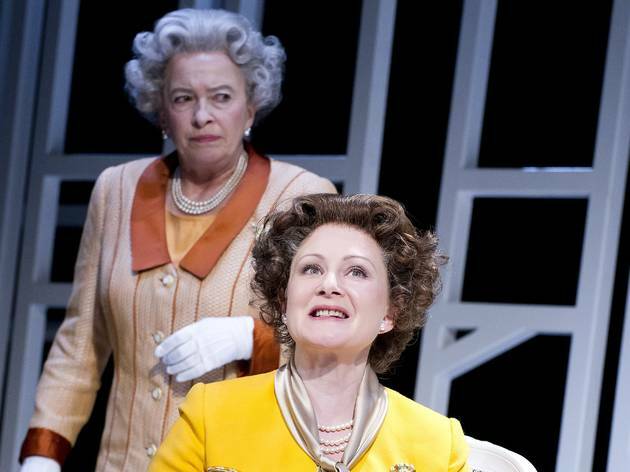 Stepping out from the firm public versions of each woman’s personality – as solidly lacquered as their eerily similar hairdos and black handbags – is an enormous acting challenge. 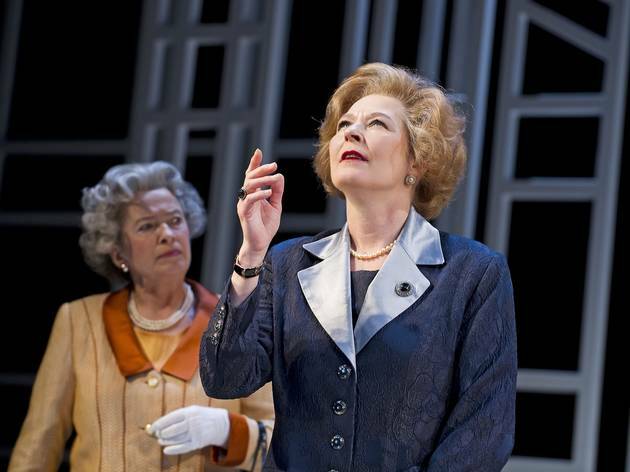 All four rise to it brilliantly – especially Fenella Woolgar as the young Mags, caught between obsequiousness and her iron will; and Marion Bailey as the older Queen, who comes across as a rather fun-loving, gossipy old lady. 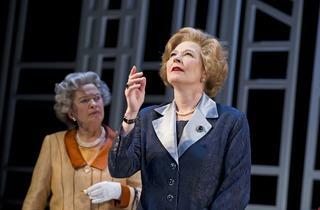 It is odd to see our monarch defending socialism, and reminding the intransigent Thatcher of the plight of the poor. 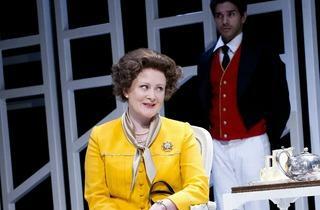 But Buffini is very aware of this irony– in one of the play’s several neat meta-theatrical moments, one of her characters voices it on stage. 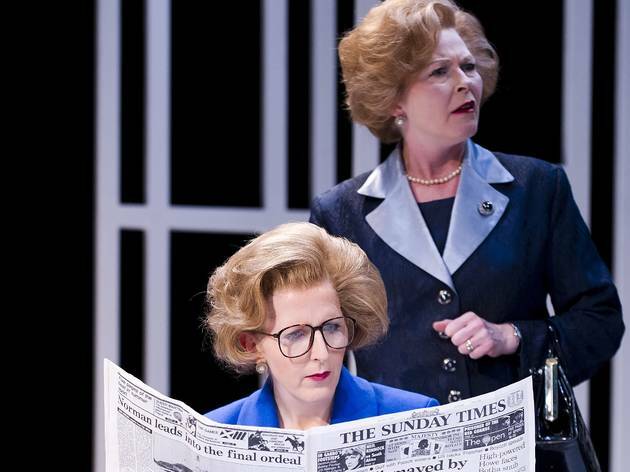 And the little evidence we do have about the real relationship between the two women does point towards the Queen’s standing a little to the left of Thatcher – which, to be fair, it didn’t take much to achieve. 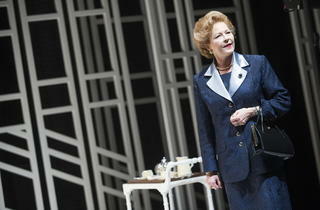 Designer Richard Kent’s set – a large white frame, reminiscent of palace railings, in the shape of the Union Jack – gets the atmosphere just right, and the play zips along under Rubasingham’s direction. Book your ticket today. Terrific show! 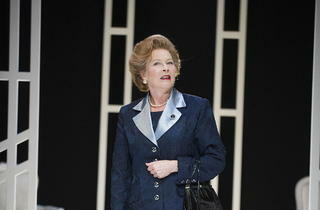 Smart, witty and well acted. The only negative was the lack of suffiect air conditioning. It was very warm night and it was suffocating in the theater. It's surprising how the simplest ideas are often the best. With just 6 actors and a simple stage set, the cast managed to create an entertaining, funny and poignant evening that kept me riveted. 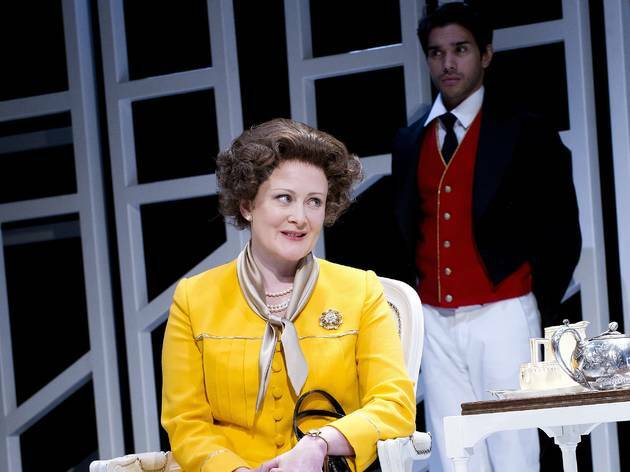 The older queen and younger Maggie were particularly convincing, but then the fact that the footman played Nancy Regan as well shows you that with good acting, you can imagine anyone is someone else! 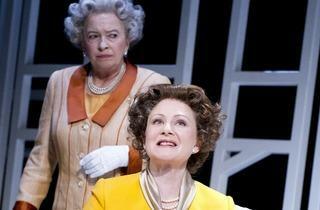 This has to be one of the best plays I have ever seen and look forward to going to see it again. Whether you love or hate Maggie, youll still love this. “Oh, it’s just so, so good”. 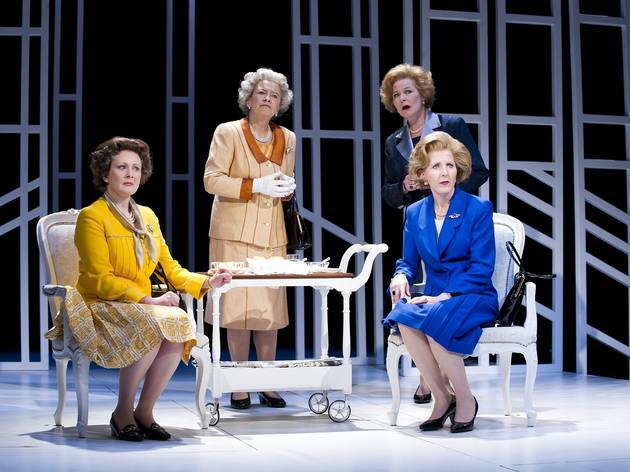 That’s usually all I say when asked what I thought of Handbagged at the Tricycle Theatre in Kilburn before adding “go and watch it!” But how else can one do justice to a play with only a cast of six but out of that six, two are the Queen and two are Margaret Thatcher? The other two (the male cast members, appropriately out-numbered) play countless numbers of characters between them, including a brilliant Nancy Reagan, and display amazing talent for a variety of accents. But the real bravo is for the Queens and the MTs. 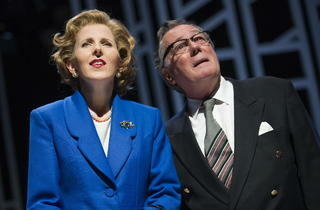 Both a young and older version of both icons (and yes, on stage at the same time but no, it isn’t confusing) lead us through Maggie’s time in office as if we are party to their Tuesday meetings over tea at Buckingham Palace or at times, as if we have come to watch them speak at some mad political rally. The magic is all in the delivery and the acting, not to say that the script itself isn’t very clever, because it is. 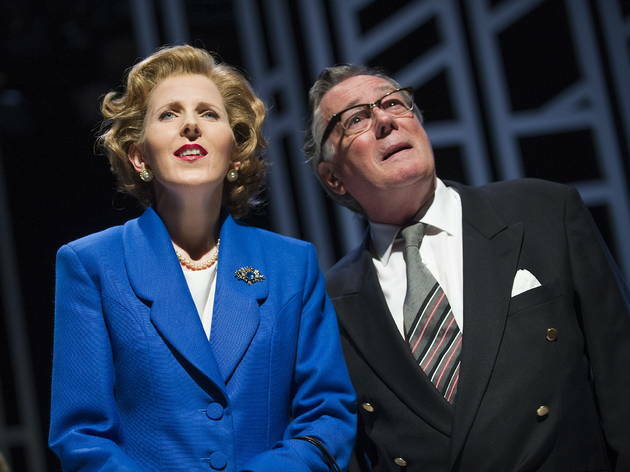 But you really feel that you’re watching a real Maggie every time you hear “Dennnnis” and then, particularly, when she suggests that we “push on” rather than allow us an interval - but the Queen would, of course, rather give her people what they want. So we do have an interval and we scoff cake with tea until we are called back in. It’s so, so good. Go and watch it!